For BiodiversiTree, scientists and volunteers planted nearly 20,000 trees on former cropland. Forest ecosystems cover almost a third of the land on Earth, contain the vast majority of all terrestrial species, directly support the livelihoods of millions of people across the globe, and provide key ecosystem services like carbon sequestration, timber production, soil stabilization, and watershed protection. Most forests are naturally diverse in genotypes, species, structure, and function, and this diversity provides resilience and adaptive capacity in the face of changing environmental conditions. Nearly all forest plantations and some restoration projects, however, are planted as monocultures, a practice which leaves them ecologically and economically vulnerable to shifting conditions. In contrast, the Smithsonian Environmental Research Center is conducting a long-term, large-scale experiment restoring the naturally diverse coastal forests along the heavily modified shorelines of the Chesapeake Bay. This ‘BiodiversiTREE' experiment manipulates tree species and functional diversity along natural gradients to investigate forest response to climate change from the molecular to the watershed level, a project that will last for more than 100 years. The BiodiversiTREE experiment manipulates (1) tree species richness (1, 4, and 12 species from a pool of 16 ecologically important species), (2) functional diversity while holding richness constant, and (3) the source provenance of trees (e.g., northern versus southern populations). We established this experiment at the landscape scale (> 30 acres with over 24,000 trees in 75 35x35m plots) in a fully instrumented watershed that has been monitored by SERC personnel for >30 years. It is designed to be an experimental platform for decades. Moreover, the site has been in continuous corn agriculture for >30 years, resulting in soil with a distinctive C4 isotopic signal. Because trees are C3 plants, we will investigate the speed and magnitude of soil carbon turnover with natural isotopic tracers, something that could not be done at this scale with other methods. Importantly, we also installed a sister-experiment at the Smithsonian Conservation Biology Institute in Virginia. Along with two similar experiments in Panama, these ‘BiodiversiTREE’ experiments give the Smithsonian Institution an incredible research platform to address large-scale questions about the importance of tree diversity for key ecosystem functions. Does tree species diversity impact forest productivity and ecosystem function? 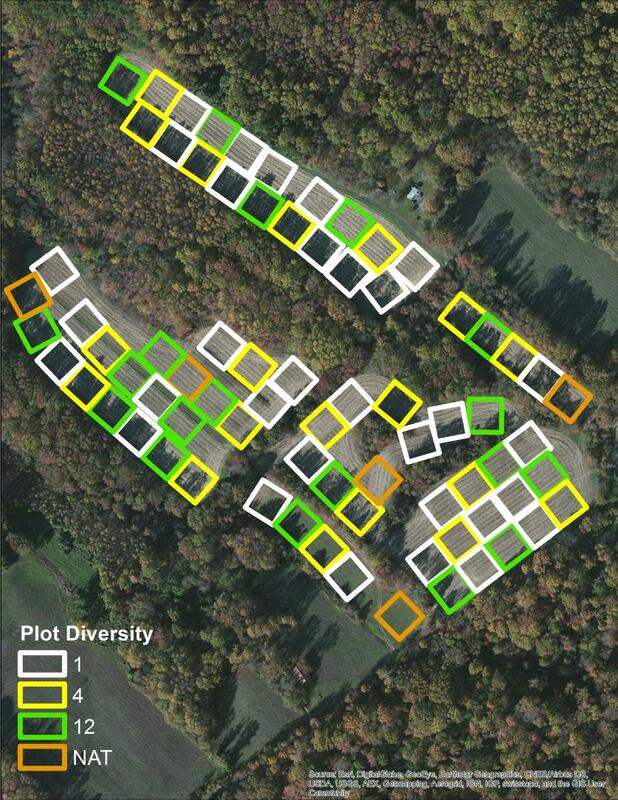 BiodiversiTREE at SERC utilizes a classic diversity-ecosystem function manipulation, whereby 16 tree species are planted into monoculture plots (n=2 plots per species), 4-species plots (n=19), or 12-species plots (n=19). Each plot is 35 x 35 m in size, and density is held constant at 255 trees/plot (hexagonal grid spacing with 2.4 m between trees). 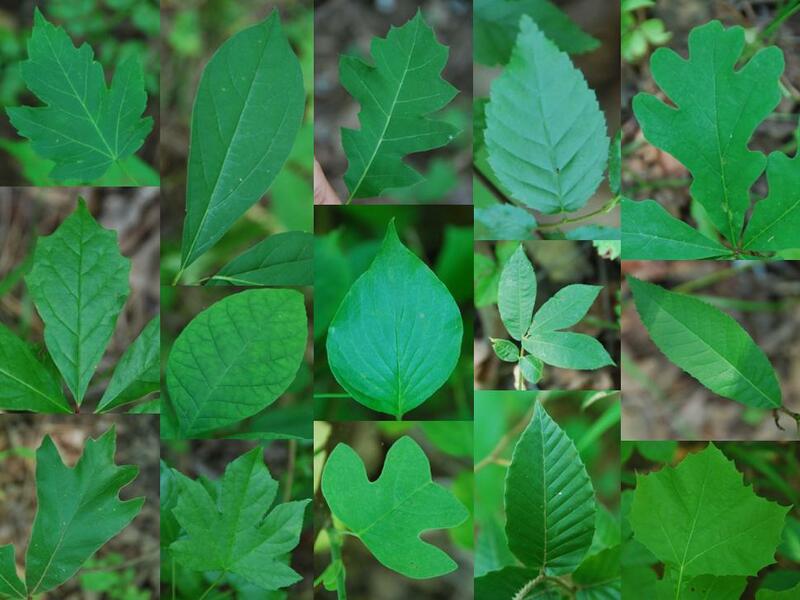 The pool of species includes fourteen canopy and two sub-canopy tree species, including 16 of the top 20 species by basal area in local forests: Acer rubrum, Carpinus caroliniana, Carya alba, Carya glabra, Cornus florida, Fagus grandifolia, Fraxinus pennsylvica, Liriodendron tulipifera, Liquidambar styraciflua, Nyssa sylvatica, Platanus occidentalis, Quercus alba, Quercus falcata, Quercus rubra, Quercus velutina, and Ulmus americana. For comparison, natural patterns of species diversity in similarly-sized plots range from 1-13 species. Thus, our experimental manipulation of 12 species spans the natural gradient of species diversity found in local forests. We will monitor tree survival and growth over time, focusing on a core of n=143 trees in the center of each plot. To account for edge effects, each plot will also have a buffer strip of 112 trees in a 2.4m band that will not be sampled. To address this question, each of our 4-spp plots is arranged on a gradient of all arbuscular mycorrhizal species, all ectomycorrhizal species, or every combination therein. Thus, these plots all have the same species richness and density, but varying levels of functional diversity defined by the relationship between trees that associate with arbuscular versus ectomycorrhizal fungi. The former are typically early successional species living in more mesic environments, whereas the latter are typically climax species living in areas where litter and soil nutrients are more recalcitrant. How does tree diversity impact water quality and quantity? As the forest becomes reestablished we can observe, in real-time, how water discharge changes by monitoring the weirs at the base of BiodiversiTREE at SERC and compare these data with discharges over the past 20 years. We expect that replacing cropland with tree plots will increase evapotranspiration, decreasing the amount and variability of water discharge, and that the cessation of fertilizer application will likely decrease nitrogen (especially dissolved nitrate) discharge. Understanding the time lag between reduction in N inputs to the watershed and reduction of N discharges to the watershed is important for predicting the effects of nutrient management practices in watersheds. Eventually the goal is to connect plot-level measurements of water quality to landscape-level measurements.